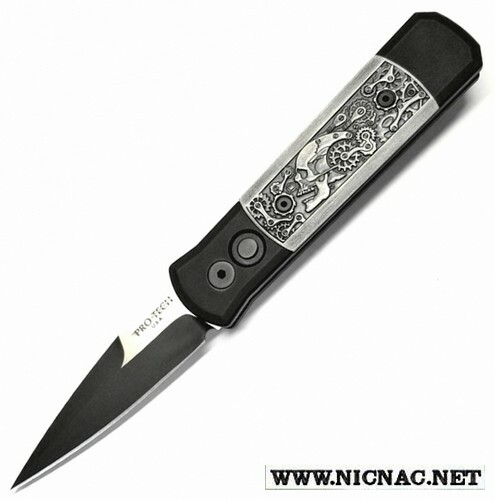 The Protech Godson automatic Knife has become a best seller in the Protech Knife line of great knives. The Protech Godson automatic Knife has become a best seller in the Protech Knife line of great knives. The Pro-tech Godson follows in the tracks of the famous Protech Godfather but is just a tad smaller. A great EDC (every day carry) knife. Specs: Overall Length: 7.56", Blade Length: 3.15", Blade Thickness: .11", Blade Steel: 154-CM, Handle Material:6061 T6 aircraft aluminum, Closed Length: 4.41", Handle Thickness: .45", Weight: 5.4 oz. Made in the USA.